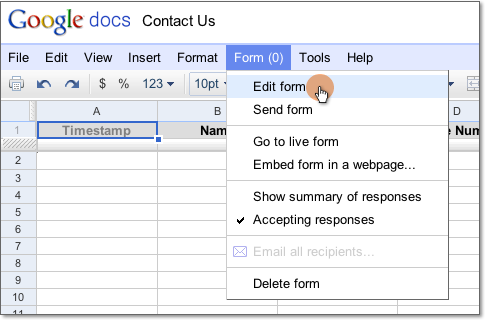 Several of the standard Sites templates include embedded Forms. When your Site was created using a template, any embedded Google Spreadsheets, Documents and Spreadsheet Forms were also copied to your account. If you are the site creator, you can find these newly-created assets in your Documents listing. 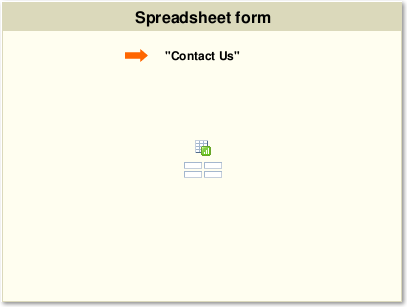 Each Form has an associated Spreadsheet that will collect that form's data. 1. To find out the name of the form, edit the page. 2. Find the spreadsheet and note the title. 4. Find the form and click to open it. 5. You are presented with the data table of the form. To add or remove fields, go to the form menu and select "Edit form". Once your form is live, any submissions will be gathered in the associated spreadsheet. To be notified of any form submissions, open the relevant spreadsheet, click on Tools>Notification rules.